I did not mean to leave without saying goodbye, although I was reaching the conclusion that I do better with the chattier groups I’ve been involved with since last summer’s Another Damned Notorious Writing Group. Since I relied on my old laptop’s online history to get to the site to check in, and since that laptop gave up the ghost, I can’t even get there any more: what I remember as the URL produces a no-such-site message. Of course, for all I know, Jonathan disbanded the group, but it’s at least as likely that my memory is at fault. Anyway, I did want to say thank you to Jonathan, Clarissa, and fjb. I expect I’ll see you around the interwebs. I would like to celebrate the Tiny Cat while we still have her with us, so here are some pictures. 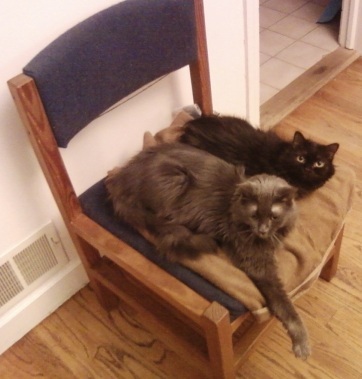 The top picture is of the Tiny Cat with her brother, the Grammarian. The lower one is of the Tiny Cat on one shelf of the cat tree. She rules the roost. Monday was computer set-up day; Tuesday was campus/library day; today I spent an unconscionable amount of time on the phone with customer service representatives (who were really quite nice and helpful, and one of whom was much amused by my very audible struggles with Glendower, who wanted to bite my pen, my hands, and my various bits of paper, and to walk all over the laptop keyboard), but finally I got off the phone, pulled myself away from recovery/compensatory/procrastinatory activities such as gardening and felinical service, and started writing. 1112 words. Most of these, it’s true, are from the conference paper, and some others are along the lines of “footnote So And So” or “FIND SHELFMARK.” (Yes, I shout at myself when writing drafts, don’t you?) But it’s 1112 words, when the journal I plan to submit to suggests 6000 as a suitable length, so I’m 18.5% of the way to my article! And thus I am happy to accept CK’s award of a “The Dame Rocks” sticker (see comments to last post), especially because the image that summons up for me is Mae West meets Debbie Harry. The tide is high, so why don’t you come up and see me sometime? OK, I’m back in the virtual world after a couple of weeks of discovering just how joined at the hip I was with my old laptop, and how accustomed I was to being able to connect to the Internet at any moment at home (even though I keep thinking that I’m not all that much of a junky because I don’t have a smart phone and don’t want one). It’s good to be here. Library access! Blogs! LOLcats! I still have to finish setting up the new computer, loading files and programs and stuff, but I’ve done the basics. The Tiny Cat is hanging in. She’s still not eating on her own, so we’re hand-feeding her every couple of hours during the day. But yesterday she went upstairs on her own, not once but twice, and both then and today she has seemed a bit brighter, more herself, so we’re keeping everything crossed in hopes that she will continue to feel better and start eating of her own volition. We’re giving up on the idea of moving, I think, unless she either does markedly better or else dies: I fear getting overwhelmed in the process of inspections, updating, packing, appointments, blah blah blah, and losing track of the Tiny Cat and her needs. Work accomplished this week: I have managed to finish a translation from Middle English of a short but difficult text that I want to teach this summer. On the Actual Real Writing front, I turned the earlier outline into a more workable, humanities-oriented outline (I had borrowed a social sciences type format from Research as a Second Language, but it really isn’t right for my discipline), and wrote a couple of new paragraphs on the paper-turning-article (must come up with an alias for it—the MMP’s companion-piece). I am amazed, actually, that I got even that much done, considering how up-and-down I have been this week. Sir John is better at taking one day at a time, whereas I have veered from despair to hope and back and forth all week. Days are all chopped up into feeding the Tiny Cat, plus entertaining Glendower, and giving the Grammarian extra meds (because it never rains but it pours), and dealing with normal errands and whatnot. I hope life will be a bit more stable this week, and that I can keep normal office hours while I get better acquainted with the new laptop. I haven’t intended to fall off the face of the earth, and I will be back when I get some things sorted. But there’s a lot to sort just now. The Tiny Cat has congestive heart failure. The good news is that she is responding to a diuretic and perking up a bit, so we may be able to get a few more months with her. She has had so many health problems all her life that it’s not so very surprising, but all the same I am gutted. Just when I was looking forward to a productive, happy summer. Still no new laptop, so only sporadic internet access. Still other (happier) life complications going on in the background (travel, real estate, that sort of thing). My goal for the week is to do something, anything, useful and work-related every day, starting today (yesterday was all day at the vet or in too much of a state to do anything). Today I did a chunk of teaching-related translation. Owen Barfield, This Ever Diverse Pair (London: Gollancz, 1950; rpt. Barfield Press 2010), 37. And now I will go home, arriving past my bedtime, and sometime either tonight or tomorrow morning I will pack. I have to pick up a friend at the airport tomorrow just past noon, and I’m hoping we can leave from there . . . so I’m sure I’ll wind up with either too much or too little stuff packed. But what this all adds up to, not that I can believe it right now, is that I’M DONE with the spring semester. I’m not sure if this means PARTAY at the ZOO or just s.l.e.e.p t.h.r.o.u.g.h the c.o.n.f.e.r.e.n.c.e. . . . . either one would have its points! Owen Barfield, This Ever Diverse Pair (London: Gollancz, 1950; rpt. Barfield Press 2010), 4. So here we are on the last Friday of our spring 2012 writing group (week 13, if you’re counting). There will be a 15-week summer group at amstr’s site, starting 14 May. This has been the last teaching week of my semester. I feel simultaneously that the term went very quickly and took a long time doing it. I’m feeling snowed under with grading, conference paper, other projects, and bits of Life Admin, and every time I sit down I remember something else I should be doing. And yet this is what happens at the end: the loose ends somehow do get wrapped up. Grades get assigned, papers get presented, the flurry of tasks swirls madly for awhile and then settles down. Let’s think about where we’ve been, before moving on. What have you achieved in the last thirteen weeks? What helped you get writing done? What obstacles did you acknowledge, name, and cope with? Whether you exceeded, met, or fell short of the goals you set in February, you’ve made some progress. Recognize and celebrate that forward progress; think about how to capitalize on what you have gained from this spring’s efforts. Antonia Fraser. Must You Go? My life with Harold Pinter. New York: Doubleday, 2012. 219.